Are you wanting to learn how you can get involved in the ancillary businesses surrounding the new Legal Cannabis Industry? From tech to medicinals, entertainment and much more. There are opportunities available to PARTICIPATE IN or INVEST in, once in a lifetime Opportunities! Are you wanting to learn how you can become involved in the exciting Cannabis Industry, or are you a Cannabis professional that is looking for a group of Dynamic, Ambitious and Diverse people in the industry to Network with? Women Abuv Ground presents their "Knowledge and Network" monthly event series that bring information enriched education to cannapreneurs of every field. In our Knowledge and Network meetings you will find the most qualified professionals within the cannabis space providing our attendees with invaluable education. Each meeting will consist of a moderated panel of speakers that will provide education and information to the audience and will conclude in a Question and Answer session. Translation services may be available, if you may need translation services (Spanish), please email info@womenabuvground.com and notify us in advance. Topic: From Corporate Mainstream to Cannabis. Join us in learning how you can transition from corporate life and career, to entering the "green rush." Panel will speak about how they transitioned and are now able to build, grow and learn in the emerging cannabis industry. WOMEN IN WEED! LOS ANGELES – Are you canna cool? Women Abuv Ground is excited to announce that Stormy Simon, former president of Overstock.com, will be the keynote speaker for its upcoming “Knowledge and Network” networking series. Stormy will discuss the topic of “Taking the Leap From Corporate America to Cannabis” on Saturday, March 18, 2017 at 6 p.m. at the Café Club Fais Do-Do, located at 5257 W. Adams Blvd. in Los Angeles. 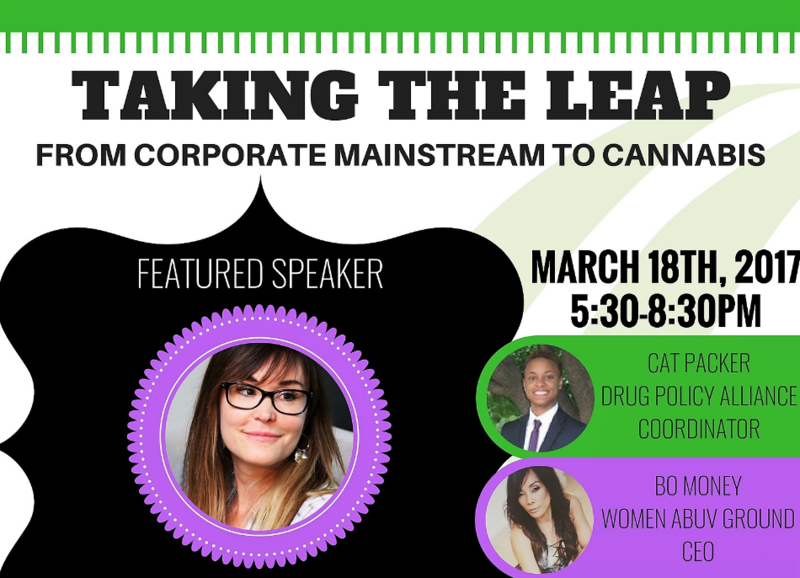 Cat Packer, the California policy coordinator of the Drug Policy Alliance, will also be a special guest. Cannabis advocates and cannapreneurs are invited to join conversation about the emerging billion-dollar cannabis industry. The mixer is presented by Women Abuv Ground (WAG) and Men Abuv Ground (MAG), two sister networking organizations, headed by Bonita “Bo” Money and former NFL Super Bowl champ Marvin Washington, respectively, dedicated to educating and empowering people of color in the emerging cannabis industry. Simon is an e-commerce innovator, pioneer and proven business leader. She joined Overstock.com in 2001 during the formative years of e-commerce, when the company's revenue was less than $20M and employees numbered under 100. She held various key positions, including co-president, and managed various departments, including Business-to-Business, Public Relations, Books, Movies, Music and Games. She was promoted to VP of Branding in 2004 after writing and producing the iconic "Discover the Secret of the Big O" campaign, which contributed to Overstock.com becoming a household name. During her tenure, Overstock became a top 25 e-tailer by traffic and grew to nearly $2B in revenue. Last summer, she stepped down as president of Overstock to explore the emerging American cannabis industry.